Human IL-1 Rrp2, Fc Tag (IL2-H5254) is expressed from human 293 cells (HEK293). It contains AA Asp 20 - Arg 335 (Accession # Q9HB29-1). The protein has a calculated MW of 62.4 kDa. 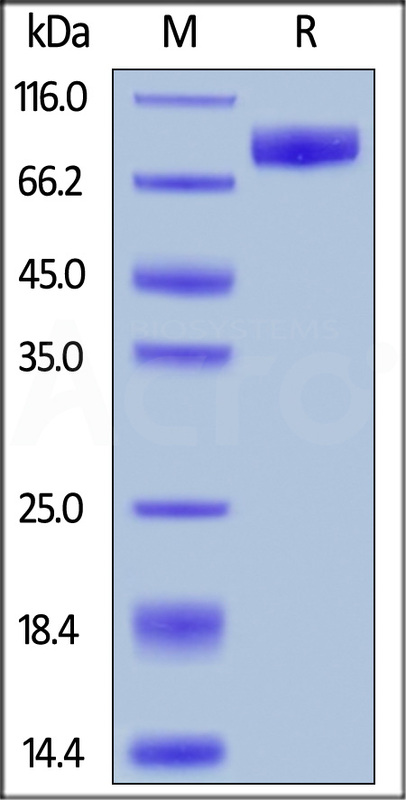 The protein migrates as 70-90 kDa under reducing (R) condition (SDS-PAGE) due to glycosylation. Human IL-1 Rrp2, Fc Tag on SDS-PAGE under reducing (R) condition. The gel was stained overnight with Coomassie Blue. The purity of the protein is greater than 95%. 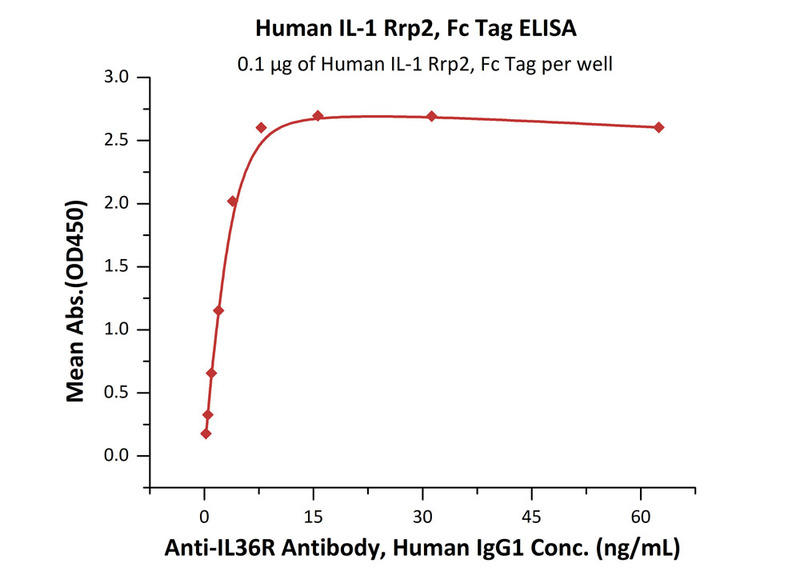 Immobilized Recombinant Human IL-36Ra / IL-1F5 at 2 μg/mL (100 μL/well) can bind Human IL-1 Rrp2, Fc Tag (Cat. No. IL2-H5254) with a linear range of 0.156-5 μg/mL (QC tested). The Interleukin 1 receptor family (IL-1 R) comprises at least eleven members including IL-1 RI (IL-1 R1), IL-1 RII (IL-1 R2), IL-1 RAcP (IL‑1 R3), ST2 (T1/IL-1 R4), IL-18 Ra (IL-1 Rrp/IL-1 R5), IL-1 Rrp2 (IL-1 RL2/IL-1 R6), IL-18 Rb (AcPL/IL-1 R7), IL-1RAPL‑1 (TIGIRR‑2/IL‑1 R8), and TIGIRR-1 (IL-1 R9). All family members possess three immunoglobulin (Ig)-like domains in their extracellular region. Most members also have an intracellular TIR (Toll-like receptor/IL-1 receptor signaling) domain that is also conserved in the Toll-like receptor family. Related proteins, SIGIRR (single Ig domain-containing IL-1 R-related molecule) and IL-18BP, differ from the other members by having only one Ig domain. (1) Boraschi D., et al. 2013, Semin Immunol., 25(6), 394-407. (2) Lovenberg TW., et al. 2013, Semin Immunol., 25(6), 394-407. (3) Debets R., et al. 2001, J Immunol., 167(3), 1440-6.